Now that fat is out of the spotlight, the focus for many in low carb and vegan circles has turned to protein as the macronutrient that needs to be avoided for health, good blood sugar control and longevity. At the same time there are still are plenty of ‘meat heads’ who say that their ‘brotein’ can do no wrong and you can’t get enough of it. In the sea of conflicting opinions and advice, how do we determine the optimal amount of protein that will suit our situation, goals and needs? 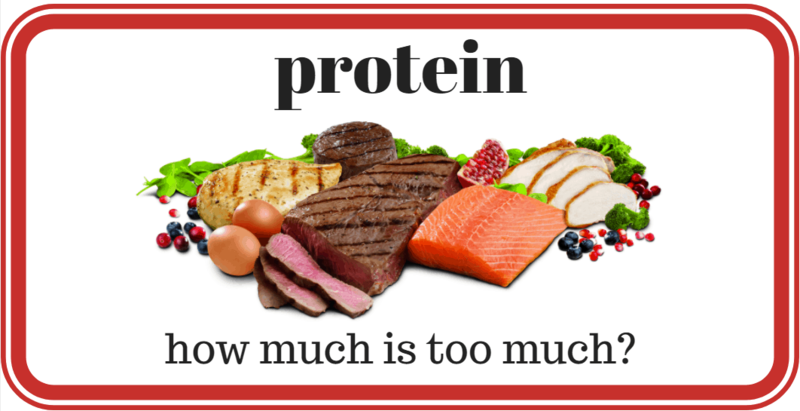 How much is too little protein? This is an intriguing, controversial and multifaceted discussion. So hold on as I try to unpack the various perspectives! First, let’s look at the general recommendations for protein intake. Protein recommendations are often given in terms of grams per kilogram of lean body (LBM) where “LBM” is your current weight minus your fat mass. Protein is required to support your muscles, not your fat. lean body mass (LBM) = body weight weight x (100% – %BF) / 100%. None of these methods are particularly accurate. However, calculating your body fat levels or protein intake to a high degree of accuracy is not necessary for most people. According to Cahill’s starvation studies we burn around 0.4g/kg LBM per day of protein via gluconeogenesis during long term starvation. After we burn through the food in our stomach and then the glycogen stored in our liver and muscle, the body will turn to its own internal protein stores (i.e. muscles, organs etc) and, to a lesser extent, fat (glycerol backbone) to obtain glucose via gluconeogenesis. The figure below shows that we use less protein the longer we go without food. After a couple of days of no food, fat and ketones kick in to supply the energy deficit. People with better insulin sensitivity may burn through less protein as they are able to access their body fat stores for energy more easily when they go without food. However, people who are lean and insulin sensitive may have less body fat to burn before the body will turn to protein during fasting. Hence, extended fasting is not typically recommended if you are super lean. Gluconeogenesis peaks at around two days and decreases thereafter as insulin levels decrease and ketones rise further. While chronic muscle loss is bad news (sarcopenia), particularly in old age, short term gluconeogenesis and autophagy is not necessarily a bad thing as the body will ‘self eat’ and clean out the old and sick and superfluous parts of the body for fuel. After a fast the body is primed and highly insulin sensitive and ready to build new muscle. Fasting can actually be beneficial for gaining muscle provided that the refeed has adequate amounts of amino acids to support muscle growth. The Daily Recommended Intake (DRI) for protein is 0.84g/kg of body weight (BW) while the Estimated Average Requirement (EAR) is 0.68 g/kg BW. Keep in mind though that the DRI is a recommended minimum per day to prevent diseases related to protein deficiency. This is not necessarily optimal. Older people appear to require 1.0 to 1.3 g per kilogram of total body mass per day protein to optimize physical function, particularly whilst undertaking resistance exercise recommendations. As discussed in the article Is there any relationship between macronutrients and diet quality (micronutrients) it’s actually quite hard to achieve adequate levels of vitamins and minerals while also hitting these minimum DRI levels. According to Simpson and Raubenheimer in Obesity: the protein leverage hypothesis (2005) people with diabetes may actually need to eat more protein to ensure that they have adequate levels to build lean muscle mass given that gluconeogenesis can be higher due to insulin resistance. Keep in mind too that minimum protein recommendations are given in terms of total bodyweight, not lean body mass. For someone with 30% body fat 0.8g/kg BW will convert to 1.1 g/kg LBM. If you fast for a day or two you should consider compensating with more protein on your feasting days. If you are fasting for fat loss there is no need to replace additional fat when you feast. If we dig a little deeper we see that there are also requirements for individual amino acids as shown in the table below. Depending on what you’re eating you can be deficient in some amino acids while getting enough other amino acids. The Nutrient Optimiser reviews the individual amino acids to make sure they are all adequate. People who are running close to the minimum DRI for protein overall are typically deficient in a handful of individual aminos. The average protein intake for the general western population is about 1.2 g/kg LBM or around 16% of calories. This is greater than the minimum required to maintain nitrogen balance in the figure above and the DRI values. It seems that most people get enough protein without trying too hard. However, what constitutes as “enough” protein will vary depending on whether you are going through puberty, weight lifting,a middle aged sedentary office worker or an elderly person in a nursing home. Appetite is a strong drive that ensures that you don’t stop eating until you get enough protein. Average protein intake seems to be consistent across cultures and time. Recent research indicates that, when fasted, we can use up to 3.5g/kg/day and breakdown and metabolise up to 4.3g/kg/day. This makes sense in an evolutionary context where would be primed to use a lot of protein after going without and then making up for lost time after a successful hunt. ‘Rabbit starvation’ is said to occur when people only have lean protein available and just can’t get enough calories in because they are eating only lean protein. However, I have seen people eat higher levels of protein in an energy excess situation when they are trying to gain weight (e.g. Andy Mant who is trying to gain size eating and muscle 4.4g/kg LBM or Bailan Jones who is a growing young man with type 1 diabetes at 5.0g/kg LBM). From a pure calorie standpoint we could theoretically eat up to around 7g/kg LBM using very protein foods. However, most people will struggle to eat more than 3.5g/kg LBM because protein is very satiating and it is hard to find protein containing foods that don’t come with substantial amounts of fat. The chart below shows the nutrient score for the highest protein 10% of the foods in the USDA database. What we can see is that high protein foods provide a ton of amino acids while lacking key vitamins and minerals. This is not an optimally balanced diet at a micronutrient level. Rather than worrying specifically about ‘too much protein’ I think it’s more useful to think in terms of getting the range of micronutrients you need without having to consume excess energy. I think the real problem eating ‘too much protein’ is that once our protein goes too high we end up reducing the amount of vitamins, minerals and essential fatty acids that our food contains. While it is important to get adequate amino acids, it is also important to get adequate vitamins, minerals and essential fatty acids. How will you spend your “discretionary calories”? I think it’s important to keep in mind that the DRIs for protein are a minimum to prevent disease and should not be treated as optimal targets or maximum values. Finding the right balance of all the essential nutrients is quite a balancing act. In this video Dr Donald Layman points out that if we targeted the minimum DRI for protein, carbs and fat we would end up with only eight hundred calories per day whereas, on average, we eat around 2300 calories per day. Hence, there is a window of “discretionary calories” that we can chose how we fill to make up our daily energy requirements. People in low carb circles are fond of saying ‘there is no such thing as an essential carbohydrate’. So, once we cut the carbs out we are left with only 314 calories to meet our essential macronutrient requirements as shown in the table below. Now this might be reasonable if we were minimising calories for weight loss (e.g. we could try to live on protein powder and Omega 3 capsules). However, this this would be impossible to achieve with whole food. The chart below shows the break up of energy sources if we were living on the minimum DRI for protein and essential fatty acids. 85% of our energy would be coming from our body fat stores. This would be the ultimate protein sparing modified fast (PSMF) however there is a pretty good chance we would struggle to obtain adequate levels of vitamins and minerals from 300 calories. Then once we reached our goal weight we would need to work out what we are going to fill the rest of our intake with to prevent drastic weight loss (and literally starving to death)? Another option is to fill the window of ‘discretionary calories’ with carbohydrates which would look like this. Filling your energy deficit with protein would be impossible in terms of available foods (even with protein powders which are only 80% protein) as well as the strong satiety that would kick in well before then. The other option is to fill the remaining energy deficit with dietary fat. This looks like a therapeutic ketogenic macro ratios. This will be difficult without consuming the majority of your energy intake from butter, cream and MCT oil. My suggestion is to look to fill your remaining energy requirements with foods that provide the micronutrients you need while keeping an eye on the insulin load of your diet. Keeping your blood sugar and insulin levels down will help normalise appetite and access your own fat stores for fuel. However, ensuring that you are getting the micronutrients you need will help you prevent nutrient cravings with less energy which will be ideal for optimising longevity, insulin resistance and blood sugar levels. How much protein are real people actually eating? Protein in real life varies significantly, as evidenced by the fifty or so people on whom I have run the Nutrient Optimiser analysis. As you can see in the table below, protein intake in real life is highly variable. The average protein intake amongst these people who are generally following a low carb diet is 2.1g/kg LBM. 6 and 15% energy from net carbs. Very few of these people are consuming anywhere near the minimum DRI levels for protein. And the people who are the closest have some of the poorest nutrient scores. Unfortunately, simply eating protein doesn’t build muscles. You also need to exercise to use the protein to build lean body mass (i.e. muscles). If you’re active, you’ll need more protein for growth and repair of muscles. If you’re sedentary you’ll need less. There appears to be an upper limit to how much protein can be used for muscle protein synthesis (i.e. to grow and repair your muscles). If you’re active, then it’s likely that your appetite for protein will increase to make sure you get these higher levels of protein to prevent muscle loss. someone who is sedentary won’t trigger more muscle protein synthesis with more than around 0.9 g/kg LBM. So, if you are wanting to minimise energy intake while still building muscle you could use these values as a minimum protein intake. is protein really a good source of energy? We typically think in terms of the macronutrients, carbs, fat and protein as if they are all sources of energy. However, there are some that argue that protein should not be considered be an energy source equivalent to carbs and fat. Protein is critical for growth and repair of our muscles and organs and our neurotransmitters. While it is true that protein can be converted to glucose and ketones if required, the reality is that it is not easy for the body to do this! The amount of energy lost in processing each macronutrient (i.e. the thermic effect of food or specific dynamic action) is shown in the table below. Compared to carbohydrate and fat, it takes a lot of energy to convert protein to glucose. The body just doesn’t want to do it unless there is absolutely is no glucose available from any other sources. Why would your body store excess energy as fat, if it meant to burn protein as soon as the chips were down? Protein is functional tissue and has many purposes other than energy storage, whereas fat is specialised for energy storage. Would it not make sense that you would use fat for energy instead of protein? Why would we think Mother Nature is some kind of crazy? There is only a small capacity for protein storage in our blood stream and we waste around 25% of the energy from the protein as heat in processing it. Hence, the body typically doesn’t drive us to overeat protein, but it can be used for fuel if there is nothing else to burn. It makes sense that protein sends a strong satiety signal back to our brain once we have eaten as much as we can use. It’s also useful to look at protein in terms of oxidative priority. Craig Emmerich from mariamindbodyhealth.com has prepared the below refinement of Ray Cronise’s oxidative priority chart (see Oxidative Priority, Meal Frequency, and the Energy Economy of Food and Activity: Implications for Longevity, Obesity, and Cardiometabolic Disease) by adding in ketones. The body will prioritise clearance of alcohol because there is no storage system for it. Similarly, the body will look to clear ketones from the system because there is minimal storage capacity for them in the blood. The body will look to clear protein that hasn’t been used for muscle repair and neurotransmitters for brain function. We will turn to glucose, for which we have a greater storage capacity in our liver, muscles and bloodstream. Lastly, once we have burned through all these other substrates, will we look to burn our fat, either dietary or the fat stored on our body. So, if you want to burn body fat you need to limit alcohol, exogenous ketones, protein, carbohydrate and dietary fat. I think Cronise’s oxidative priority concept is another way to look at the insulin load of our diet. Our body uses insulin to keep glycogen stored in our liver and fat in our adipose cells until the other fuels are used up. There is no point in going out of our way to consume excessive protein because it takes more effort to burn through before we can get to the fat on our plate or our belly. However, it is logical that our appetite switches off once we get enough protein because there is no room to store excess protein and it’s hard work to burn it. mTOR (mammalian target of rapamycin) controls our fuel flow and our appetite. Similar to insulin and insulin-like growth factor (IGF-1), mTOR promotes growth. Growth is good if we are a baby or a teenager. But some people grow too much. There is a limited number of times we can turn over our cells in our lifetime. Constant periods of plenty without periods of restriction leads to continued growth of unwanted things like cancer. Dr Ron Rosedale is a proponent of limiting protein in an effort to extend lifespan. There have been a number of other proponents of limitation of animal protein in the vegan circle for some time. Dr Greger’s Plant Based NutritionFacts.org recommends limitation of methionine, leucine and isoleucine. Dr Steven Gundry recommends a grain free high fat version of the protein restricted approach. One option in response to this theory is to consistently restrict protein to achieve long term health. Some people try to keep their protein low to ensure that they are always in a state of autophagy or muscle breakdown and self eating. However, I don’t think chronic intentional protein restriction is necessarily optimal. What we are aiming for is adequate, but not excessive, energy intake (including protein) without malnutrition (i.e. vitamins, minerals, aminos and essential fatty acids). On top of this, balanced periods of feasting and fasting will allow autophagy and growth. In the days before agriculture, fertilisers from fossil fuels, and even refrigerators in our homes (less than 100 years ago) our environment would enforce periods of growth and period of famine. These days, we can source cheap food to keep on growing 24/7, 365 days a year. We have no externally enforced periods of autophagy when we can clear the old and dying proteins in our body. If we have growth interspersed with fasting, then we give the body a chance to build muscle and use protein for repair while also giving the body a chance to clean house and purge the dying white blood cells and burgeoning cancer cells before it gets ugly. Your body will naturally crave more protein in periods of activity and repair and less in periods of inactivity. If your appetite isn’t working as well as you’d like it to (i.e. you have more body fat than you would like), you can force a feast / fast cycle based on managing your weight or your blood glucose levels. Like many things in life, optimal protein intake is a balance between extremes. More is not necessarily better. But less is not better either. We want our body to thrive on enough, but not too much energy while still getting the micronutrients it needs. Too much mTOR and IGF-1 can stimulate excessive growth and cancer while too little can lead to muscle loss, which does not support health in old age. The EAR and DRI for protein actually increase for people over 70 to prevent sarcopenia. If you are lacking lean muscle mass then there is a greater chance you will not have great insulin sensitivity in old age. If you are suffering from sarcopenia you may fall and break your hip and never get up again. As shown in the figure below, too much or too little IGF-1 is not good. As with most things, it’s a balance. Protein is critical to life so our appetite typically makes sure we get enough. “Obesity: The protein leverage hypothesis” suggests that we keep eating until we get enough protein. If we are getting plenty of protein then we will stop eating when we get enough energy and protein. In the wild, animals have an innate sense of the nutrients they need and which foods will provide those requirements, whether they be protein, energy or other micronutrients. While it’s easy to track macronutrients and calories, I think it’s often the body’s micronutrient needs that derail our calorie restriction efforts and aspirations. Most of the food that is available to us these days is much more deficient in micronutrients than it once was, but at the same time it is flavoured and coloured to make it appear that it has heaps more nutrition than it actually does; so we keep on eating the food that is manufactured to look and taste good, all the while not getting the micronutrients we really need from the food, so we just keep eating. For instance, the figure below from Spectracell shows the nutrients that are often missing in people with diabetes. We need all these nutrients from our food to support our mitochondria to effectively produce energy from our food and stop excess glucose and fatty, fatty acids and ketones building up in our blood stream. It’s important to meet your minimum protein intake which may be higher if you are growing, older or active. Once you’ve met the minimum intake of protein and essential fatty acids (about 314 calories per day) you need to decide what you are going to fill the rest of your “discretionary calories” with to prevent starvation. If you’re managing diabetes and not looking to lose weight you will likely want to keep your carbohydrates low and get more of your energy from fat (see optimal foods for diabetes and nutritional ketosis). If you’re wanting to lose body fat then perhaps you can count the energy from your body as part of your daily intake and try to maximise the nutrient density of the remaining intake. That is, maximise nutrients with the minimum amount of energy intake (see optimal foods for fat loss). You can get too much protein but at the same time you can get too little protein. Periods of feasting and fasting are beneficial rather than targeting chronic high or low protein. It’s very hard to get a good balance of micronutrients with low protein. Protein tends to come packaged with other nutrients. If you focus on micronutrients (vitamins, minerals, amino acids, fatty acids) then the macronutrients (carbs, fat and protein) largely look after themselves. We will get enough, but not excessive, amounts of protein. calculation mistake in the protein table ! I watched Dr Layman’s video in its entirety. one salient point is the fact that you need at least 30 g of protein in each meal to start the anabolic process in your muscles. What about that ? Seems to me that its really key. Below that, He says that proteins are wasted and end up as mere calories. It seems also that too much protein per meal is also wasted as there’s an energy limit beyond which the muscles stop the anabolic process. So as I understand it what counts is more the amount of protein per meal which mus be in a narrow range of 30 to 50 g to be efficient. More recent studies suggest we can use 3.5g/kg lbm if fasted. Satiety kicks in. I think it’s hard to eat too much protein. It’s just hard to convert to glucose or fat. Hey there, great post indeed. This guide is worth reading. Glad to know how much protein is too much, people will find this post really helpful to measure consumption level of protein. One question – in the section citing Lemon, 1999 paper, the graph and numbers are in g/kg BW and not LBM, yes? This is based on current RDA shown in the graph (0.8 g/kg) which is expressed in terms of BW. Not sure. Protein units can be confusing. Glad you liked it.